I have been enjoying the fresh basil, dill, cilantro, and parsley I'm growing indoors this winter. I use the herbs to make fresh pesto, teas, salsas, and more. Gardening is not limited to outside in the summer. Herbs are probably the easiest to grown indoors, but there are many more. Last winter I grew salad tomatoes and carrots. As I learn more, I was amazed by how many food crops you can actually grow indoors. Some types of edible indoor gardens to try include window gardens, containers, special systems, and indoor greenhouses. The most limiting factor for growing plants indoors is light, so whichever option you choose must include a bright window or supplemental lighting. Many herbs can be successfully grown in a window that receives several hours of sunlight daily. Window gardens are very easy to do, especially when using prepared herb kits. I've grown small pots of cilantro and lettuce on my windowsill. Simply sprinkle some seed in a small container, gave it a little water, and placed it all in a mock greenhouse. My favorite mock greenhouse is one of those zippered plastic bags that linens come in, but Ziploc bags or plastic deli containers with lids work too. There are many possibilities with pot herbs. I often grow rosemary indoors in the winter since it doesn't overwinter outdoors. Another great idea is to do a mixed container of herbs in a large bowl or strawberry pot. Or try a small patio or salad tomato grown in a 5-gallon bucket. There are many products on the market today that make indoor gardening easier. I have an Aerogarden in my kitchen where I grow herbs and greens all year long. 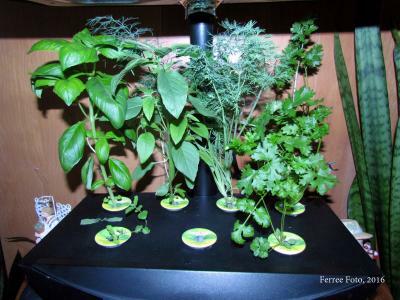 An Aerogarden is a hydroponic system that grows plants in water using a premixed nutrient solution. The system has lights that raise and lower to match plant growth. It is all contained and quite simple to use. Herbs commonly grown indoors include basil, chives, oregano, parsley, and thyme. Continuously harvest these herbs as soon as they have enough foliage to sustain growth. Not only does this provide you with fresh herbs for cooking, but also keeps the plants nicely pinched back to keep plants bushy. Wondering what to do with your fresh herbs? Try adding them to your hot tea. A few sprigs of basil add a subtle spicy flavor to green or black tea. If you don't have special infusers for brewing herbal teas, simply use a strainer or a small tied cloth. Plant some herbs for your enjoyment throughout this winter. While cold and snow blanket your outdoor garden, the indoor herb garden will continue to thrive and provide.